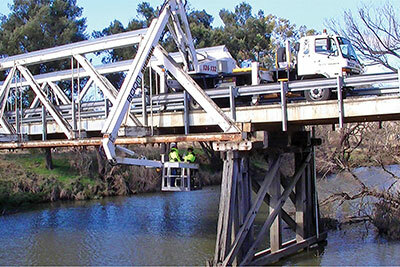 Local Government Engineering Services offers inspections that meet with the RMS bridge inspection procedure manual & can also provide inspections to meet with ARRB Local Roads Bridge Management or councils' requirements. LEVEL ONE - are drive-by inspections which identify obvious safety issues on the bridge, conducted by a Supervisor or Bridge Inspector at least once every year. LEVEL TWO - are condition rating inspections carried out in accordance with bridge inspection procedures & conducted by an experienced bridge inspector normally every two years. LEVEL THREE - are structural engineering inspections conducted by an experienced structural engineer. Our experienced staff are available to carry out all levels of structural inspections inclusive of load capacity rating of concrete structures and non-destructive testing of timber structures. We can assist with, or provide councils with a maintenance program for repairs or upgrade works. We have competent staff available for project management, contract documentation preparation & internal training of staff. Where bridge conditions are beyond repair, LEGS will suggest options for bridge replacement and provide condition reporting that will assist Council to seek funding under the bridge replacement program. Glen Innes Severn Council - Inspection of flood damaged bridges providing condition report and damage status. The report was utilized by Council to support a damages claim. Walcha Shire Council - Level 2 inspection of a timber truss bridge at Woolbrook. Project involved producing a condition report with repair recommendations and timeframes, and also included site training of Council staff. 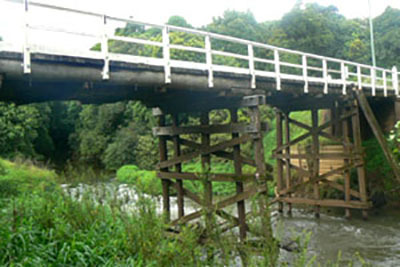 Byron Shire Council- Inspections, condition assessment and reporting of 35 timber, concrete and steel bridges throughout the Byron Shire. 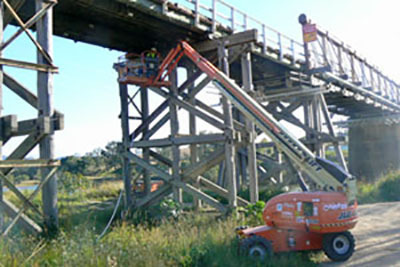 Non-destructive testing was carried out on all timber bridges and recommendations of repair & Load Limits were provided. Moree Shire Council - Inspections of 47 concrete bridges throughout Shire. Defects identified were recorded & assessed to allow an analysis of the structure. The analysis categorized structures into different gross mass limit categories. Council received a detailed description of each bridge including an assessed live load capacity, axle mass limit and truck loading category. RMS Northern Road Services - Level 2 Inspections of Bawdens, Tabulam and Maria River Bridges. Various structures including steel and timber truss bridges. Project involved producing inspection reports including condition rating of all components & boring records.